Qantas has updated its training manuals for visual approaches after an Australian Transport Safety Bureau (ATSB) investigation found a pilot flew an Airbus A330-200 carrying 211 passengers and 11 crew too low on approach to Melbourne Airport. 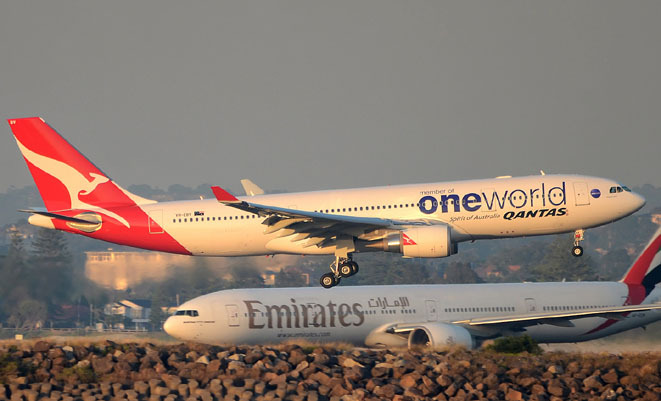 The March 8 2013 incident involved Qantas A330-200 VH-EBV flying from Sydney to Melbourne and on descent into Tullamarine Airport in daylight hours in the early evening. After being cleared for approach, the captain, who was the pilot flying, set an altitude target of 1,000ft in the autopilot and selected the landing gear down. However, as the aircraft descended through about 1,800ft the first officer advised the captain that “they were low”, the ATSB report said. “The captain reduced the rate of descent by selecting auto-flight vertical speed mode but a short time later the enhanced ground proximity warning system (EGPWS) provided ‘TERRAIN’ alerts followed by ‘PULL UP’ warnings,” the ATSB report said. At the time of the EGPWS alert, the aircraft had descended to 1,400ft, which in that area was 600ft above ground level, with 9nm to run to touchdown, the ATSB said, noting that this was 100ft below the control area lower limit and 1,900ft below a normal three degree descent profile. The report noted the flight crew were on the fifth day of a five-day duty roster pattern and had flown from Perth to Sydney earlier in the day. Moreover, the ATSB report said the captain, who had 21,907 hours’ experience including 2,272 hours on the A330, recalled having an interrupted sleep, waking at about 0500 with a throat irritation that worsened as the day progressed. The captain also had no appetite for food and did not have breakfast and lunch, consuming only tea, coffee and soup during the day. While the captain reported being tired prior to commencing work, he “self-assessed being fit for duty”. “The ATSB found that during the visual approach the captain’s performance capability was probably reduced due to the combined effects of disrupted and restricted sleep, a limited recent food intake and a cold/virus,” the ATSB report said. In response to the incident, the ATSB said Qantas had made some changes to its instruction for visual approaches. “Qantas updated their training material for visual approaches and enhanced similar material in their captain/first officer conversion/promotion training books,” the ATSB said. What has happened to VFR? Unfortunately, “pilots” are being turned into “flight monitors” these days, with increased automation and computerisation. This event was quite disturbing to read about……do that at night, with a bit of granite around the airport, a less attentive F/Officer, and it becomes one of this “controlled flight into terrain” events you just wonder how on earth……..
Forgive my maths, but 9 nautical miles is about 17km or so away from the airport, exactly where a Cessna might be scooting around past the controlled zone (the A330 was below the controlled airspace limit), minding its’ own business, keeping a good lookout but not expecting a jet to swallow it up. Somewhat disturbing, and as the earlier poster has commented…….what has happened to basic VFR skills? I have seen F-111s flying lower than myself (and about 10 times faster) but I never really expected to have a close encounter of the nasty kind with an Airbus!!! To correct your terminology, they fly IFR as required for a high-capacity RPT operation. “What happened to their visual skills…” is a better way to put it. So, they flew Perth to Sydney earlier in the day…Anyone ever thought about making changes to the workload, maybe giving pilots a chance to rest? Changing procedures will not lower the workload on pilots and will not make human mistakes that could come from fatigue go away. But then, less working pilots would mean for a carrier to employ more pilots, which would mean more costs to the company and less profit margin. And that of course the shareholders really do not like to happen. Doesn’t sound like a training or procedures problem to me. Tired pilots make errors, thats why there are new rules for fatigue management.